Gor Mahia’s new signing Eric Kipkurui says he wants to go on and replicate his scoring form from Zoo Kericho as he begins his new life as a K’Ogalo player. Kipkurui has been a core figure at Zoo since they were promoted to the top tier, each season scoring 10+ goals and had 13 last season. 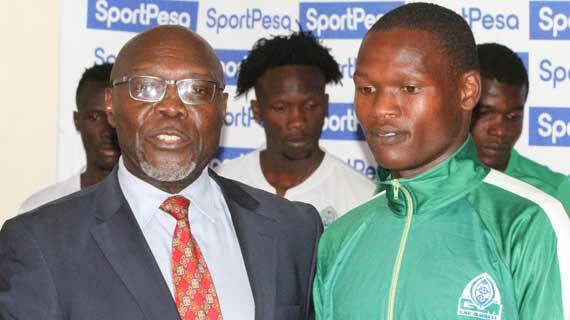 He says he knows the pressure at Gor is increased but adds he is ready to play his part for the new club. “This is a bigger challenge for me and I wanted to come here because Gor play in the Champions League and this will offer me a bigger platform to show myself to the world. I have done well at Zoo and I thought it is a good opportunity to have a new challenge,” he said. “All the goals I scored at Zoo, I want to maintain the same form here and probably score more. Last season I scored 13 and played less. This season if I have more playing time, I am certain there will be more goals,” he added. The striker has said he is ready for the pressure that comes with playing for Gor, noting that those are some of the ingredients that come with growth in football. Kipkurui was among eight players unveiled by the club on Monday ahead of the new season including Ugandan duo of Shafik Batambuze and Erisa Ssekisambu. Midfielder Kenneth Muguna was also re-introduced to the Gor faithful after leaving the club in January for an unproductive stint in Albania. The club has also signed striker Eric Ombija from their junior team with the youngster having spent last season on loan at Coast Stima. Also coming on board were Pascal Ogweno (Kariobangi Sharks), Geoffrey Ochieng (Western Stima) and Castor Ogendo from Kenyatta University.